Like many fans, baseball was obviously an important part of my childhood and an important part of my relationship with my dad and my brothers—and in my case, with my mom as well. No one else’s mom could throw BP as well as mine. My parents were very careful, however, to make sure that baseball was a tool they could use to help me grow and learn valuable life lessons. They also understood the influence that watching professional ballplayers had on young kids—so even though baseball was absolutely a positive experience in our young lives, my parents set boundaries and didn’t let us have free reign. It’ll sound strange nowadays I’m sure, but here’s an example: we could watch the Braves on TBS or listen to a game on the radio no problem, but if our parents were not in the room with us then the rule was we had to turn the volume down during commercials. I get that it might sound like a strange rule today … but the truth is we didn’t question it because it was a boundary our parents set for us and we just accepted it. And looking back I appreciate it—because our parents knew how impressionable we were, how much we idolized the Braves and the guys who wore that uniform, and how easily influenced we were by anything associated with our favorite team. In other words, they had standards—and they wanted to make sure people and products that met those standards influenced us. In my adult life I’ve been a baseball coach, an athletic director, and a teacher—and I’ve spent a lot of time worrying about who my student-athletes idolize. Today I spend all my time writing, but when I shoot hoops and talk NBA with my nephew or go see a Rays or Braves game with my nieces I still worry about who is influencing them. And I wish the guys who were glorified during baseball’s steroids era hadn’t been treated like gods at the time. I wish we lived in a simpler time when parents could tell their kids to turn down the volume during commercials—but in the tech-savvy world we live in, kids today have a much different reality. And they need boundaries more than ever, and everyone knows we need athletes to be better role models—but kids today also need tools to help them make good choices in life. All that to say this—I’m glad there are organizations like Dale Murphy’s I Won’t Cheat Foundation. I’m glad there are athletes with standards and morals who kids can look up to and learn from. I’m glad that for every bad example my nephew sees today on ESPN that I can share with him stories about truly heroic ballplayers like Cal Ripken, Jr. or Dale Murphy or Kirby Puckett. I like it, a lot—and I think every fan of baseball should support the principles that I Won’t Cheat promotes. You can visit IWontCheat.com to learn more about the comprehensive program available for schools and youth leagues. 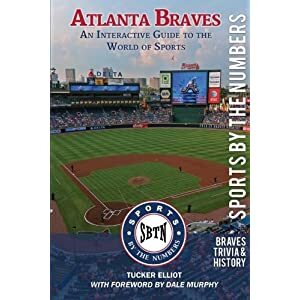 This book is about the history of the Atlanta Braves. In it you will find the greatest players and moments in franchise history. It’s my hope that you will also find the same positive message in these pages that Dale Murphy’s Foundation promotes—that character and integrity matter, and goals we achieve with our character and integrity intact have real value. This entry was posted in Uncategorized and tagged atlanta braves, dale murphy, history, trivia, tucker elliot on April 20, 2012 by tuckerelliot.